As you all know, I hosted a Red Earth event this past weekend...and with that came some yummy breakfast food. Backstory: My mom bought me a Babycakes Cake Pop maker last year for Christmas. It has taken me almost a year to use it. It is probably good that it took me this long because it is so easy to use and so fun! I'm going to be making so many doughnut holes in the coming days! So, because I own this little gem, I thought I should take a stab at cake doughnuts. So good! So Easy! So Fast! With the Babycakes Cake Pop maker anyway. I am in the market for a doughnut pan for a full-size version too. They are called cake doughnuts for a reason. Making them is not much different than making a cake. Lauren of Lauren's Latest came up with the doughnut recipe. And it is so good! 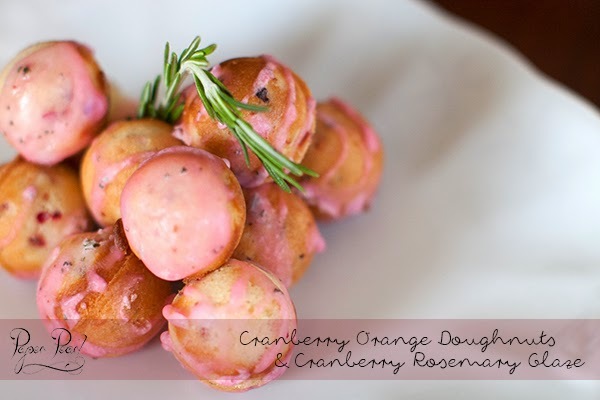 The glaze I chose to create for this little morsel is cranberry rosemary. There is something about rosemary in sweet dishes. I'm really into it in the winter months. Place the first four ingredients in a small saucepan. Stir frequently while bringing to a boil. Reduce heat to med-low and cook 2-3 minutes. Remove from heat and let cool 20-30 minutes. Once cooled press the cranberry mixture through a wire mesh strainer into a bowl. You will have more than enough cranberry sauce for your glaze. To make the glaze mix 2-3 tablespoons of the cranberry sauce, chopped rosemary, powdered sugar and water (just enough for a good consistency). Make the glaze as strong as you would like by adding more or less cranberry sauce. I decided to drizzle my doughnut holes and not use as much glaze to limit some of my sugar intake. The doughnuts are quite flavorful and don't need much extra.